Di Simpson will be the guest speaker at Thompson-Ames Historical Society’s monthly meeting on Monday evening, August 7th at the Society’s Union Meetinghouse, at 24 Belknap Mountain Road in Gilfo rd Village. “The Greatest Generation”, as Di Simpson’s presentation is called, focuses on World War II memories, which are admirably preserved at the Wright Museum in Wolfeboro. Ms. Simpson’s August 7th talk will tie in the efforts of those at home and how these affected a nation at war. Artifacts from 1939-1945 will be brought and the lecture attendees are urged to bring any collections or war reminders along with them to share with the audience. Audience participation will be encouraged during the lecture. 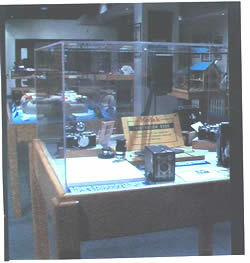 As the accompanying photo indicates, the “Home Front” area of the Wright Museum includes a new display of Kodak cameras and accessories from 1939-1945. In conjunction with Thompson-Ames Historical Society’s August 7th program, the Gilford Public Library is hosting a Wright Museum display. The evening will begin with the brief monthly meeting of Thompson-Ames Historical Society at 7:00 p.m. and will conclude with light refreshments after the evening’s program. Although the evening’s activities are open free to the public, donations are always gratefully accepted. Thompson-Ames Historical Society is a 501(C)(3) not-for-profit educational organization that receives funding for its programs from the Samuel P. Pardoe Foundation.